The end of the year brings with it the holidays, gift giving, and time for renewal among Valley residents. It also is the time to consider an extra special gift of which many people may not be aware. It's the Arizona Charitable Tax Credit, or what has been known as the Working Poor Tax Credit. The Arizona Charitable Tax Credit is the gift that keeps on giving - through the holidays and beyond. It is popular among many residents because it reduces a person’s tax liability dollar for dollar, down to zero. And the impact is significant on the approximately 700 charities that benefit from tax credit donations in the state. Valley residents may claim up to $400 in a dollar-for-dollar tax credit and married couples filing jointly may claim up to $800. The credit is available in addition to school or foster care tax credits. The tax credit is truly a force multiplier for the hungry, the homeless, and the abused. The impact on our community is tremendous. The tax credit is a gift that benefits our entire community. You can claim up to $800 and get it right back on your taxes, while seeing the immediate impact on hungry families and those in need. Local nonprofit organizations like A New Leaf rely on contributions to sustain services such as emergency shelter, basic needs, employment assistance and other life-saving programs. A New Leaf, like many other organizations, relies on the generosity of the community to improve the lives of others. With your help, children find family, domestic violence victims find protection, the homeless find shelter, the poor find provision, and veterans find peace. Your gifts make all the difference in helping our city’s most vulnerable individuals find a better life while creating a better future for all. 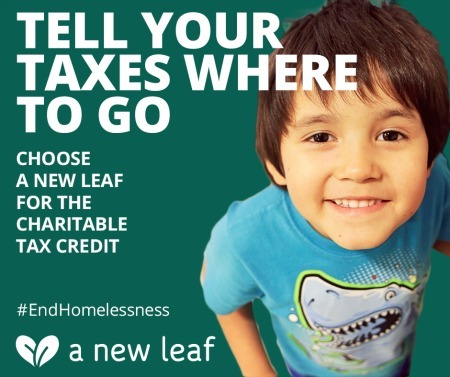 As you prepare for the New Year, we thank you and hope you’ll support A New Leaf by making a gift today through the Arizona Charitable Tax Credit. If you are interested in making a tax credit gift or want to learn more, go to TellYourTaxesWheretoGo.org.